I was tired of The Expendables (2010) before I even saw it. Who wants to watch two hours of senile old Grandpa waving his gun around, pretending the war’s still on? 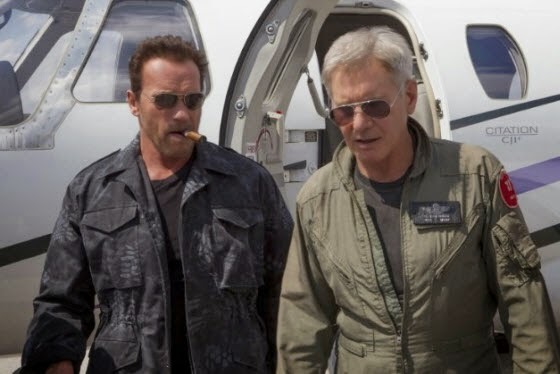 With their “we may be old, but we can still be badass” mentality, the first two Expendables films swung and missed spectacularly. This was especially offensive to me as a passionate fan of the films that Stallone and Schwarzenegger used to make. Here, in the twilight of blockbuster season, I found a film that neither satisfied nor subverted my expectations, but was content to provide a simple, entertaining experience, and to hell with everybody else’s opinions. 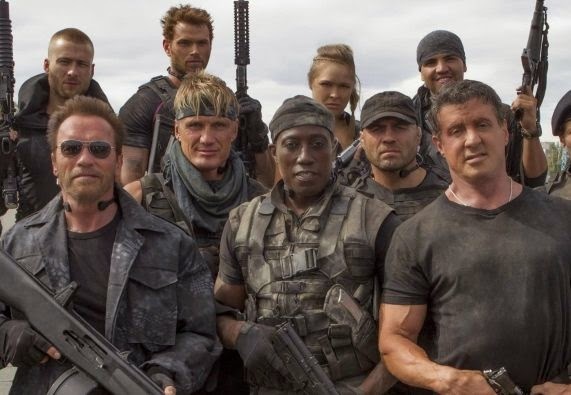 The Expendables 3 is exactly what it aims to be, and thank God they’re finally aiming in the right direction. Sylvester Stallone’s Barney Ross – the man John Rambo might have aged into if he hadn’t been so socially inept – comes too close to losing a member of his beloved, murderous adopted family to an old rival, the war criminal and arms dealer Conrad Stonebanks (a locked-and-loaded Mel Gibson). So he fires the Expendables, and recruits a squad of young try-hards to follow him on a one-way trip to take out his old enemy. It’s leaner than a starving scarecrow and about as threatening, but screenwriter Stallone, director Patrick Hughes, and an ever-inflating supporting cast finally hit the target they’ve been shooting at for four years now. I was horrified to learn that the film earned a PG-13 rating, because the legacy of the 80s actions flicks that the Expendables brand emulates would hardly have survived long enough to warrant imitation, faced with such puritanical censorship. The Expendables 3, however, which was was obviously filmed as an R and chopped down into a PG-13, proves that savagery alone does not a competent action film make (see The Raid 2 for an example of how easily that mistake can be made). Quick cuts disguise the brutality and there isn’t a single drop of blood, except that which might occasionally pop out of a recently-punched lip. Watching muscular men pump round after harmless round towards the camera has the effect of an episode of The A-Team, in which a car or two might flip and some barrels would explode, but there’s no real teeth to the virtual violence. I’m surprised I’m saying it, but this is all to the better – the R-rated carnage and digital blood fountains of the first two Expendables films clashed terribly with the tone they were trying for, and here the premise finally seems to have found its footing. The Expendables 3 is grounded in the Saturday morning lightheartedness that the series should have embraced out of the gate, and the film is far more entertaining for it. Moreover, the cast is clearly having more fun than ever. There’s a distinct air of gratitude about many of the performances, and a lack of the stifling machismo that rang so false with so decrepit a cast in the prior films. There are the requisite gun-measuring contests – mostly waving about between Jason Statham’s Lee Christmas and Wesley Snipes’ “Doctor Death”, this time around – but they’re played with less conviction than ever. Expendables 1 and 2 felt dishonest because they tried, and failed, to recreate the magic of the past. Here, everyone seems to have finally accepted the fact that they’re not the mountainous megastars they used to be, and that maybe they should just try to make an entertaining flick while they still can. As of this film, I am declaring that Arnold Schwarzenegger and Harrison Ford are officially too old to be in movies anymore. They have literally lost control of their facial muscles and it is deeply uncomfortable for me to watch their jowls wobble through the same kind of dialogue they shouted with taut intensity in their thirties. Poor Arnie hobbles into frame in his introductory scene as if his gout is flaring up, and I’m surprised Dolph Lundgren can even speak through his slackened lips. Stallone is the only one who still looks formidable (despite his face’s striking resemblance to a melted candle), and his lack of ego is disarming. It’s refreshing to see him perform with some patience and humility. Jet Li is feloniously underused, appearing for two scenes in which he cracks jokes about his height and never throws a punch. Putting a gun in Jet Li’s hand is an act of shameful waste, but it’s apparently enough to earn him billing over more than half the cast. It’s Mel Gibson who turns in the kind of performance I wanted to see – his Stonebanks is easily the best villain of the summer (if you don’t count Godzilla) – with both a grim sense of humour and a vicious, earnest air of danger. His rivalry with Stallone’s Barney is all the plot this movie needs, and I think Gibson, perhaps helped by his somewhat estranged public persona, wears the bad guy suit with natural ease. Lee Christmas quips at one point that “even morons need friends.” Stallone and Co. seem to have taken this mantra to heart, crafting a stupid, cleanly-made movie that’s as fun to watch as I’m sure it was to make, with none of the false seriousness of its predecessors and the sense of cameraderie that should always have existed between a band of aging stars coming together to wax nostalgic. With three of these things under their belts, it’s about damn time. Let’s hope they quit while they’re ahead.